Description: This work offers a seminal research into Arabic translations of the Pentateuch. It is no exaggeration to speak of this field as a terra incognita. Biblical versions in Arabic were produced over many centuries, on the basis of a wide range of source languages (Hebrew, Syriac, Greek, or Coptic), and in varying contexts. The textual evidence for this study is exclusively based on a corpus of about 150 manuscripts, containing the Pentateuch in Arabic or parts thereof. 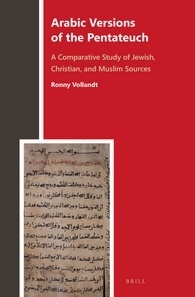 Citation: John Kaltner, review of Ronny Vollandt, Arabic Versions of the Pentateuch: A Comparative Study of Jewish, Christian, and Muslim Sources, Review of Biblical Literature [http://www.bookreviews.org] (2016).